The Jaybird X2 improve on the BlueBuds X in all the right ways, making them some of the very best sport in-ears available in their price range. Jaybird first introduced its now uber-popular BlueBuds X in 2012. While the landscape of wireless headphones has rapidly shifted in the years since, the BlueBuds X held up in a manner that can’t be said about much of their competition. Part of this is due to the BlueBuds’ quality, but it also has to do with the lifetime warranty against sweat-related damage. That said, it was certainly time for a refresh. While Jaybird covered sweat-related damage, some found that general wear and tear was enough to render their headphones unusable. This, combined with advances in terms of sound quality meant that it was a perfect time to introduce the sequel. Ditching the branding for a simpler name, the Jaybird X2 in-ears are instantly recognizable, and could even be confused for the BlueBuds, but there are big changes under the hood. The box is very similar to the box that carried the Jaybird BlueBuds X. Open it up and the first thing you’ll find is another smaller box that holds the ear tips. With this out of the way you’ll find the inner box that holds the headphones and the included carrying case. Inside the case is the USB cable and a pouch holding the in-ear “fins” and three X-fit clips. While the BlueBuds X were available in two colors, the Jaybird X2s bump that up to six options: Midnight Black, Storm White, Alpha, Ice, Fire, and Charge. The overall look is very similar to the BlueBuds X but with more color and less chrome. The design reflects the minimalism popular in 2015 designs, and the X2s definitely look better as a result. The build is plastic but still quite solid. Like the BlueBuds X, the Jaybird X2s come with a one-year limited warranty as well as a lifetime warranty against sweat-related damage. This sweat resistance makes the X2s a good option for bringing to the gym, as do the in-ear “fins” meant to hold them in place. Something new to the X2s is the addition of three new pairs of tips. The silicone tips included with the BlueBuds X are still present, but now Comply memory foam tips are included as well. These seemed to help me find a better fit, as once I found the right match of in-ear fins and tips, the X2s stayed put. There are two ways to wear the X2s, with tutorials for both available on the Jaybird website. The included carrying case has received a major upgrade, with the clamshell design of the original being swapped out for a silicone case that is both easier to use and more protective. The Jaybird X2s still use Bluetooth 2.1, and the company points out that later versions do nothing to benefit sound quality. The X2s use the company’s Shift Premium Bluetooth audio, which is a custom implementation of the Bluetooth SBC codec, and SignalPlus, which also appeared in the BlueBuds X. Unlike those headphones, I didn’t notice occasional skipping during playback with the X2s. The Jenna voice prompts from the BlueBuds X are still present here, providing helpful voice feedback for pairing and other options. One minor quibble is that I found that these prompts could be a little on the loud side at times. This wasn’t a deal breaker and wasn’t loud enough to hurt my ears, but a slight reduction in the volume would be welcome. The included mic and remote features three buttons. The plus and minus buttons control volume with a tap, while holding them down for one second will skip tracks forward and backward, respectively. The middle button will answer and end calls or pause and resume playback with a simple tap, while holding it down for one second will turn the X2s on or reject calls. Holding the button down for four seconds turns the X2s off. The original BlueBuds X claimed a battery life of around 8 hours, but often struggled to reach that number. The Jaybird X2s claim 8 hours as well, but they actually reach that number in use. For some reason Jaybird calls this Battery HD, which is puzzling, but this battery life is still impressive given the small size. Charge time using the included micro USB cable is estimated as less than 2.5 hours, though this will obviously depending on what you’re using as a power source, since none is included. The flap covering the micro USB slot is located on the same side as the remote, and opens easily despite how well concealed it is. The simple inclusion of better tips means that it’s easier to get a better fit, and therefore get better sound out of the X2s. The best tip for you depends on a lot of factors, but in my case, I found the included Comply memory foam tips worked the best, providing a tight seal without becoming uncomfortable. Once I got the right fit, I found the lows to be powerful without going over the top. Bass is well defined without giving way to boominess. The sub bass on Run The Jewels’ “Oh My Darling Don’t Cry” offered up plenty of rumble without overpowering the vocal as can sometimes happen with lesser in-ears. Burying the mids has become a trend among in-ears in this price range, but thankfully Jaybird hasn’t followed suit with the X2s. Fans of hip-hop and EDM won’t find the X2s to be too mid-forward, but the massive dip in mids present in some in-ears doesn’t appear here. The guitars, keys, and vocal harmonies on Jessica Lea Mayfield’s “Standing In The Sun” all found their place in the song, standing out without crowding each other. High-end roll-off is generally a necessity with in-ears, as the drivers being so close to the listeners ears could easily lead to piercing highs without it. That said, it’s been overdone in plenty of headphones within the last year, and again Jaybird hasn’t followed the trend. The high end is open-sounding and clear, but avoids harshness. Even after listening to all of METZ’s latest album “II,” my ears weren’t fatigued. Soundstage is impressive for in-ears, especially considering we’re talking about Bluetooth, with plenty of space around the instruments. Pavement’s swirling “The Hexx” made good use of this, sounding huge even at lower volumes. Like the sound quality, how well these block out noise will depend largely on what tips you’re using and how well they fit. The in-ear “fins” help to keep the headphones from moving around, so this will matter as well. Using the Comply foam tips I found that the Jaybird X2s provided effective passive isolation. I’m a noisy typist, but even at low volumes I found that the sound of my keyboard was completely eliminated. The X2s can handle a good deal of volume before beginning to distort, but I found that my ears gave up before distortion kicked in. Unlike a lot of the headphones we’ve reviewed, these don’t seem to have a target genre of music in mind. The EQ curve is far from flat, but worked equally well for each type of music we threw at the X2s. We’ve heard better headphones, but for the price range, the flexibility of the X2s is appreciated. From the Jenna voice prompts to the sheer amount of tutorials Jaybird makes available to help first-time buyers get the most out of their headphones, it’s clear that the company has put a ton of care into not just the product, but the experience of using the X2. The sonic signature speaks to this as well, being well-suited to any sort of music or other media instead of simply targeting a few popular genres. While the Jaybird BlueBuds X were obviously a well put together product, they never grabbed me personally. Though they’re very similar, the Jaybird X2 did manage to make a fan out of me. That alone is proof that not only do the X2s stand up to their predecessors, but surpass them in every way. 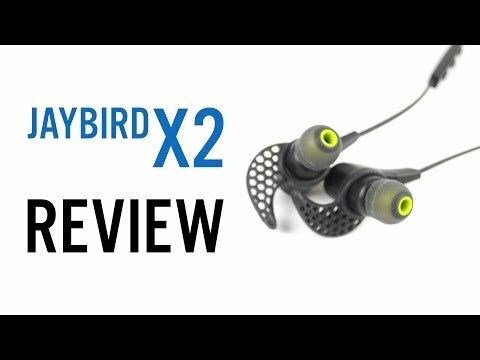 Jaybird Tarah: budget Jaybird X4?